It has now been confirmed that artists Ian Gibson and Mike Collins, and writer Simon Spurrier will be guests at this year's Dreddcon, adding to an already impressive lineup of creators. Ian Gibson is probably best known for his work on Halo Jones, the legendary strip he created with Alan Moore, which is often hailed as one of the best strips to appear in 2000 AD, and indeed British comics in general. His distinctive art style has also graced many Judge Dredd stories and a number of stunning 2000 AD covers. Mike Collins is a long-serving comics artist who has worked on a wide variety of comics for a number of publishers in his career. His work for 2000 AD includes a number of Judge Dredd and Rogue Trooper stories, and he has even written a few Future Shocks in his time. Simon Spurrier is one of 2000 AD's more recent discoveries, but in his time writing for the magazine, he has already created a number of popular stories, including Lobster Random, From Grace, Bec & Kawl and The Scrap. In further news, we can also confirm that we will be running PC multiplayer games of Rebellion's recently released Judge Dredd: Dredd Vs. Death, and there will be the chance to play miniatures-based table-top game HeroClix, featuring a range of popular 2000 AD characters. Dreddcon 4 will be held on Saturday 6 December among at the Oxford Union Society (St. Michael's Street, Oxford). Dreddcon 4 will open at 10am, and run until 5.30pm, and the Union Bar - with selected drinks at a very reasonable £1 per pint (woo-hoo!) - will stay open until 11pm. There will be a dealer room, featuring an official 2000 AD merchandise stand and a number of third party dealers, and an artists area, where a number of 2000 AD artists will be sketching and selling original artwork. 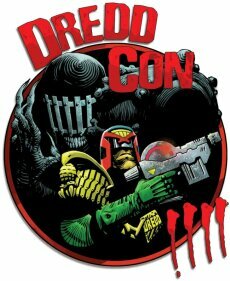 Big Finish (2000 AD audio dramas) and Mongoose Publishing (Dredd and Slaine RPGs) will be attending Dreddcon 4, and there will also be demonstrations of the new Indy HeroClix (featuring a number of 2000 AD characters), and the chance to play the new Rebellion game Judge Dredd: Dredd Vs. Death.